Henry James Trafford was born in Headington Quarry in 1880, but not baptised at Holy Trinity Church until 3 August 1886 when he was “nearly 6 years”. He was the son of Robert Trafford (born at Shotover Hill Place in 1845 and baptised at St Andrew’s Church on 27 July) and his second wife Amelia Walker (born in Wheatley in 1854). Lilly (or Lily/Lillie) Trafford (born in Headington Quarry in 1875 but not baptised at Holy Trinity Church until 27 April 1879, at the age of 4 years 3 weeks). Henry's father's first wife Elizabeth Ann Trafford died at the age of 39 in 1876 (death reg. third quarter). Ida Amelia Trafford (born in Headington Quarry in 1898, reg. second quarter). At the time of the 1881 census Henry (aged six months) was living at East View, Headington Quarry with his father Robert (36), who was described as a mason's labourer, his mother Amelia (26), his half-siblings Rosa (9), Albert (8), and Lillie (6), and his full sister Emily (2). At the time of the 1891 census Henry (10) was living at “Main Road” (Quarry High Street) with his father Robert (45), who was described as a stone waller, his mother Amelia (36), and his half-siblings Albert (17) who was a quarry labourer, and Lilly (15), and his full siblings Emily (12), Sarah (8), Walter (6), Edward (4), Edith (2), and William (four months). His eldest half-sister Rosa (19) was working as a general servant in Hackney. Henry (20) is missing at the time of the 1901 census, and it is possible that he had joined the army. (He may even be the Henry Trafford (service no. 4283) who forfeited his right to Boer War medals because he was “discharged as incorrigible and worthless”.) Meanwhile in 1901 his father Robert (57) was still working as a stone waller and living in Quarry High Street with Henry's mother Amelia (47), who was now doing laundry work, and all of Henry's full siblings: Emily (21) and Sarah (18), who were laundrymaids; Walter (16), who was a carrier’s assistant; and Edward (14), Edith (12), William Isaac (10), Lizzie (8), Laura (6), and Ida (3). In 1911 Henry (29), who was still unmarried, was back home with his parents in Quarry High Street and working as a bricklayer’s labourer. Five of his full siblings were at home: Walter (25), who was a roadman with the Headington District Board; Edward (23), who was a bricklayer’s labourer; William (20), who was a general labourer; Laura (15), who was probably helping her mother with her laundry work; and Ida (13), who was still at school. His sister Emily (32) was married and living in London and his sister Edith (22), who was working as a housemaid, was paying her a visit; and his other sister Elizabeth (17) was a servant in West Kensington. Henry Trafford volunteered to serve in the First World War and was a Private in the 8th Battalion of the Oxfordshire & Buckinghamshire Light Infantry (Service No. 13848). He enrolled in Oxford on 3 September 1914, when his health was rated A1, and from 21 September to 16 November 1915 he was with the British Expeditionary Force in France from . He then transferred to the Mediterranean Expeditionary Force, disembarking at Salonica in Greece on 26 November. He had fourteen days' leave in England from 13 to 25 January 1917 and then returned to Salonica. He caught malaria in March 1917 and spent six weeks in hospital: he never recovered, and had several relapses, which resulted in aortic insufficiency. He was admitted to the 12 Corps Rest Camp on 30 September 1917, and from 12 February 1918 he was in a VAD hospital. On 1 April he was transferred to the Braemar Castle Hospital Ship. On 18 January 1919 he embarked for the UK, and was admitted to the Sobraon Military Hospital in Colchester. He was discharged from the army as permanently unfit with 80% disablement and no hope of recovery on 25 February. He returned to Headington, and his address was then given as Vine Cottage in Quarry High Street. Henry Trafford died in Headington on 19 March 1919 at the age of 38 (according to Holy Trinity baptismal register and census information, but CWGC and grave wrongly give his age as 36). He was buried at Holy Trinity churchyard on 23 March 1919. He was the last Headington man recognized by the Commonwealth War Graves Commission as having died as a direct result of the First World War, and so has a war grave. Henry Trafford is also remembered on the stone plaque in the porch of Holy Trinity Church. 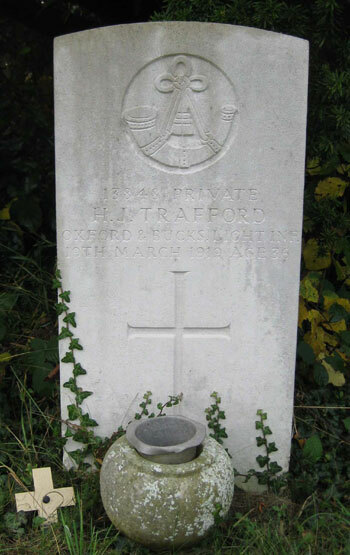 Henry’s older brother William Isaac Trafford had died much earlier in the war, on 5 March 1915 at the age of about 24. Mrs Amelia Trafford died at 29 Quarry High Street at the age of 76 and was buried at Holy Trinity churchyard on 3 January 1931. Robert Trafford died aged 87 at 12 Prison Quarters, Titmouse Lane, Oxford and was buried with his wife on 26 November 1932. Emily Jane Trafford (born 1879) married William Shorter at Holy Trinity Church on 26 December 1903. At the time of the 1911 census they were living at 12 Wolseley Road, Brentford, with three of their children (all born in Acton): Edith Amelia (4), Walter John (1), and Dorothy Ada (2 months); their eldest child William (6) was staying with his grandparents in Quarry High Street. Sarah Ann Trafford (born 1882/3) married Frederick Grimshaw at Holy Trinity Church on 25 December 1913. Walter Thomas Trafford (born 1884/5) married Edith Mary Dewe at Holy Trinity Church on 17 January 1914. They had two sons baptised at Holy Trinity: Robert Charles Trafford (born on 5 June 1914 and baptised on 26 July) and William Isaac Trafford (born on 4 December 1915 and baptised on 30 January 1916). William Isaac Trafford (born 1890/1) also died in the First World War: see separate page. Elizabeth Maud Trafford (born 1892/3) married James Albin, a Corporal in the East Lancs Regiment, at Holy Trinity Church on 16 April 1919.